This article "The Essence of Listening" was written and delivered as a recent Toastmasters speech - Project 2 in the Competent Communicators Handbook. It was a project to organize a speech, with clear transitions, opening, closing, for delivery in 5-7 minutes. At the bottom of this post is a game to test your linguistic skills in handling sales objections. This post explores the nature of objections and examines their meaning and offers an interactive game at the end of the article to test skills in unpacking the buyers objections and fluffy language. There are hundreds of ways for buyers to say no to a salesperson, but there are really only four basic objections and all other objections are variants of there four. The objections in Table 1. are the type of objection we are likely to see early in a sales cycle and very typically when we on the phone trying to advance the sale and set the next appointment. Objections typically occur when the sales person is trying to advance the sale beyond the buyer's readiness to move to the next step. "I'm not interested" is a variant of I don't have time and usually occurs when cold-calling and having asked the buyer to something they are not ready to do. If we get to the end of the sales-cycle in B2B selling and we get objections like the ones in Table 2. below, we are in big trouble. Objections are far more likely to come up in the qualification phase or during evaluation, but when salespeople don't listen and miss the buyers comments, questions and feedback, then these questions or concerns typically resurface as objections. Objections typically occur as a result of unanswered questions that salespeople missed earlier in the sales cycle, which is why reversing the buyers question is so important. 1. It won’t work for us! you have an adversary in the decision group who prefers the status quo. 2. We’re not convinced of the ROI! either you did a poor job in diagnosing needs, or you should not be in this deal. 3. The timing isn’t right! 4. The project is delayed! 5. We don’t believe you can deliver what we need! we are talking to someone else who can. 6. We've decided to proceed with a different project! a competitor has cleverly changed the ground rules and they are proceeding with them. 7. This needs board sign-off! I'm grateful to Stephen Allott who shared the above chart, based on his experience as president at Micromuse. Having sold B2B technology products and services around the World for more than 30 years, I have heard every one of these more than a few times. With the above chart there are of course exceptions and when there is a trusted advisor relationship and rapport, the buyer may well be telling the truth. 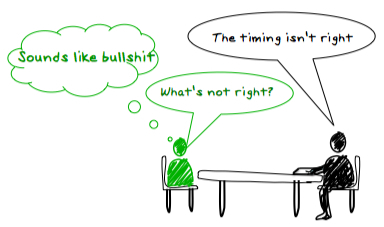 Only yesterday I was told by the EVP of a mid-sized technology company that they had corporate initiative under-way, (code for - we're doing an acquisition), that prevented them from focusing on our messaging and whiteboard story development until mid Q4 = a nice way to say "the timing isn't right". The following excerpt is from Wiki "selling technique" "While many sales techniques offer specific advice on how to handle objections and stalls, Sandler suggests that only the objecting client is able to remove the objection"
I'm in complete agreement with David Sandler on this one and am not going to offer specific technique to overcome objections...there are hundreds of entries on Google and Youtube if you are interested. I am offering an exercise in the use of precision language to get salespeople thinking about how to uncover the underlying reason for the objection, so that a conversation can occur around addressing the buyers concern. The following exercise is excerpted from the Selling Psychology section of our Selling in the Internet Age, Adaptive E-Learning program. It uses a number of linguistic techniques and should be both amusing as well as informative. Objections are not neccessarily a bad thing during the sales cycle. I would prefer to have objections, that way I know there is interest. The opposite scenario is proceeding through the sales cycle and getting no objections, which often means that you are being invited along for the bake-off and they are actively engaged with another vendor...who is getting objections. Language and communication skills are traits of the most successful salespeople. They can be learned and will pay a dividend for those sales people prepared to learn and deliberately practice using them. Sales books, blog-posts and training courses that offer “consultative selling secrets” and magical closing-techniques, constantly amuse me. Most of the ideas in these so-called secrets are common sense and have been in practice since the “Fuller-brush man” came a calling. If there truly were secrets to success in consultative selling or any other form of selling, then nobody would know them. Another myth is "Consultative Selling is Dead", but I will deal with that one another time...clearly it is not. The truth is that there is a growing body of knowledge around consultative selling best-practices that anyone with a Web browser and an ability to read can access. Great sales people are great communicators with strong ego-drive and the self-discipline, to do on a daily basis the little things that average sales people do not, that lead to successful sales outcomes. A curiosity to learn and discover what makes people tick and to synthesize new ideas to expand your view and appreciation of the World you live-in. Diagnostic skills underpinned by the use of best-practices questions that can be learned, which will enable you to chunk the buyer up to get the big picture or chunk down for specificity. Disciplined use of CRM, Knowledge Management and Performance Support tools. A reciprocal commitment (give to get) from the buyer at every interaction from asking for a demonstration to negotiating an agreement. knowledge, that enables the sales person to come the table as an equal and bring insight and an opnion that challenges the status-quo and gets the buyer thinking differently about their issues and your capabilities.